June is here and with that comes an important day. I’ve been wondering for the gift my dad would appreciate. It has been a custom to celebrate Father’s day, and we’ve been doing so for as long as I can remember. We would begin by cooking dad’s favorite meal, and end the day with a little something for dad, a token of our appreciation for all that he’s done for me, and for our family. Last year, I remember giving him a personalized mug, and he’s been using it for his coffee ever since. I haven’t decided on what to give him this year, but I’ve got a few ideas in mind. I’ve always wanted to give my dad a gift that would remind him of me, even in just a small way. I try to make sure there’s that hint of “me-ness” when I give him a gift on father’s day. I want to be able to show him, through my gift, how much I appreciate him. Unexpectedly, pondering on what to give my dad made me think about how this particular celebration came about. Father’s day has been first celebrated in Spokane, WA on the 19th day of June 1910. This idea was from Sonora Smart Dodd who, according to Wikipedia, was also the driving force behind the establishment of this special day. The idea came to mind while Sonora was listening to a Mother’s Day sermon in 1909. Having been raised only by her father after their mother’s early death, she wanted to honor her father’s sacrifices for their family. She wanted him to know that he’s special and has been an inspiration to her – being a courageous, selfless, and loving man he was. Initially, Sonora suggested June 5, her father’s birthday, to celebrate the event. However, the time was not enough for the organizers to prepare for the celebration so it was deferred to the third Sunday of June. Since then, there have been unofficial support from political figures to establish this special day for fathers. President Woodrow Wilson was honored by his family in 1916, President Calvin Coolidge recommended it as a national holiday in 1924, and President Lyndon B Johnson made it a holiday to be celebrated on the third Sunday of June. It was not until 1972 that the event has been officially recognized by President Richard Nixon declaring it a permanent national observance to be held on the third Sunday of June. And now that the third Sunday of June is fast approaching, let us celebrate fatherhood by honoring and appreciating the sacrifices made by our Dads. I have come up with a few things that you should take into consideration when planning for the perfect gift for your Dad. If your dad’s into collecting some things, such as old coins, you might consider buying something that would add to your father’s collection. Adding something to his collection shows that you support him with it. If your dad doesn’t have a collection of anything yet, you can urge him to start one by giving something he loves this father’s day. That would entail that you give importance to him and to his favorite stuffs. If you want to add some personal touch to your gift, you can opt to give something that he can use in his office or even at home! This may include mugs, pens, memo pads, or picture frames. Then you can just conceptualize a design that your dad would like or something that you and your dad both like. 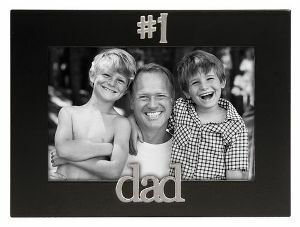 A picture of the family, with your dad of course, enclosed in a special Father’s Day picture frame can fit perfectly in his table office. This would make your dad remember fun times with the family and would probably inspire him more while working. If you have the money to buy one, why not give your dad a gadget that would help his work easier? If you don’t have enough budget, then you can try buying accessories for your dad. It may not seem as flashy as a new BlackBerry or an Iphone but it would still be appreciated if he can use your gift with his old gadget. A wireless headset would make a great gift. He can use it while driving to and from work. These are classic gifts that your dad would surely appreciate. It is in the nature of dads not to buy clothes, shoes, and bag. Maybe because the clothes, shoes, or bags they use doesn’t have to be different every week. If you will give them these as gifts on his upcoming special day, you would be able to help him save time in buying these stuffs in case he needs a new one. Remember that father’s day was born in memory and appreciation by a daughter who loved her father so much and believed fathers should be honored with a special day just like mothers are honored on Mother’s Day. Thus, the gift shouldn’t have to be that expensive because it’s always the thought of love and appreciation that counts. Therese Shaw is a small business entrepreneur and a freelance writer who occassionally writes for JAFGifts.com, an online store that sells candy dishes and other wedding gift items.